For two films of historical fiction about the complexities of romance while sitting upon the throne while balancing love, politics, health of state, anger and lust, these films couldn't be more different. 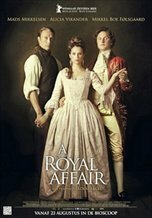 A Royal Affair is a well-enough told tale of this sort, but it decides to hone in on sentiments of betrayal and alienation in such a passive-aggressive way while The Lion in Winter socks you clear in the mouth with its straight-forward handling of an aging King trying to see past his own life and how his wife, sons and mistress fit into all of that. Mads Mikkelson and Alicia Vikander do all they can, but they can't compare to Peter O'Toole and Katherine Hepburn in my favorite performances from either actor. O'Toole and Hepburn as well as their supporting cast with known acting schlubs Anthony Hopkins and Timothy Dalton ( I kid...) make you care about a family of people that you have every reason to hate as you see their lives fall apart and come together on the screen. It's tough to beat the king of the jungle, even when you're the King of Denmark.